This was inspired by Aviva Romm's recipe many years ago. 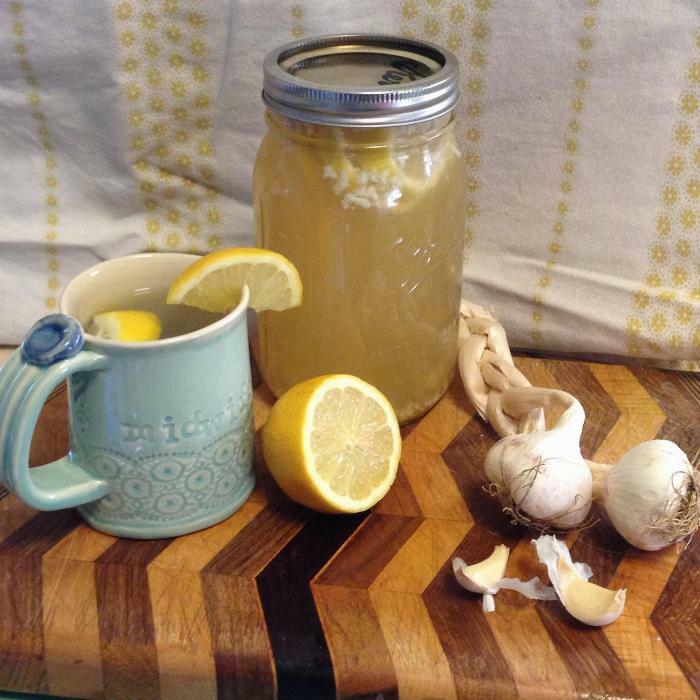 I have used it since my children were little for colds, flus, and other infections as well as recommending it to my midwifery clients for mastitis, sore throats, sinus infections, and to support their immune system when they have breast or vaginal infections. 1Put minced garlic and lemon in quart glass jar (like a canning jar), plus ginger if using. 2Add boiled water to jar and stir. 3Cover and let steep until cool enough to drink, typically 20-30 minutes. 4Add honey to jar or into mug and fill with garlic lemonade. Drink lots! 5You can reuse the garlic and lemons for a second batch of Garlic Lemonade, but the garlic loses its potency after second use. 6Savory variation: substitute bone broth or veggie stock for boiled water and honey. Usually children drink 2 cups per day, but adults can drink 4 cups per day while feeling "under the weather." I often eat the lemons and bits of garlic too. As always, please consult your midwife, primary health care provider or children's pediatrician if you have any questions or concerns regarding your individual health issues.